Access to reliable healthcare services is vital to any community. 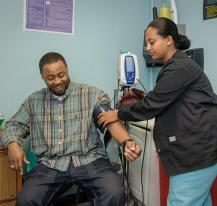 In 2012, City First collaborated with the DC Primary Care Association and Unity Health Care to finance a new comprehensive community health clinic in the Parkside neighborhood of Ward 7. Located at the intersection of Hayes Street and Kenilworth Terrace, the 42,000 square foot facility opened in 2013 and is projected to serve 48,000 unique patients each year. The new Unity Parkside Health Clinic replaced an aging and deteriorated clinic that previously served the community. The facility provides a full range of adult and pediatric services including primary care, walk-in clinic services, obstetrics and gynecology; pediatric medicine; infectious disease care including HIV/AIDS; specialty services such as ophthalmology and optometry, podiatry and dental care; behavioral medicine; and social services. In addition, the new facility houses a pharmacy, medical laboratory, Women and Infant Children (WIC) programs, and two levels of underground parking. The project was financed through City First Bank’s New Market Tax Credit program, and at $24.5 million, was the largest NMTC investment made by City First at that time. In addition to the DC Primary Care Association, City First partnered with USBanc Corporation Community Development Corporation (USBCDC), which provided a substantial equity investment to finance the development. The DC Department of Health provided grant funding to support the construction of the project through its affiliation with the DC Primary Care Association. Upon completion, the Unity Parkside clinic was expected to create 50 new permanent jobs and support 33 jobs that were to be retained from the old Hayes Street facility.